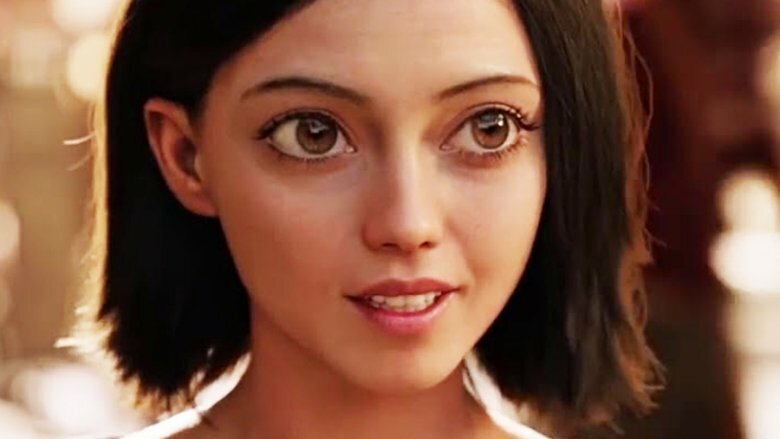 Alita's character is brought to life using computer-generated imagery, and the most striking features about her aren't her cybernetic limbs, but the enlarged eyes. Comments have ranged from humorous to outright critical, and several bring up a very important principle of animation: the uncanny valley. What exactly is the uncanny valley? It's a trick that lies at the intersection of art and human psychology. The best example involves robots: imagine an industrial robot, the mechanical arm that builds cars. It does not appear very human, and so you may not be as attached. But let's add more human features, maybe something like WALL-E or Short Circuit's Johnny Five. You begin to build more of an emotional connection with it. Now make the robot even more humanoid, something like C-3PO from Star Wars. Now he's a real character, a person in his own right, that you would be even more invested in. In general, the more human-ish an object appears, the more we will connect with it. But there is a drastic exception to this rule. As an object draws near full human likeness, it enters into the "uncanny valley." It's a point where the object appears almost completely human, but not quite fully there. The connection suddenly becomes revulsion, and people may be repelled away from the object. There are competing explanations for the phenomenon. Some say it's an unconscious physical repulsion from a "human" that appears to be ill or sickly. Others argue it's a perceived threat to human identity. Whatever the cause though, the uncanny valley has implications not just for robotic designers, but even more so for digital artists. Computer imagery has developed by leaps and bounds, and we are now nearing the capability to replicate humans on screen. Such an act always has the inherent danger of falling into the uncanny valley though, and undermining the whole effect. Audiences do respond to that, but it isn't always a liability. Sometimes the uncanny valley can be exploited if you WANT to make a character disturbing and unsettling. Case in point, King Ramses from Courage the Cowardly Dog. Anyone around the age of 20 can testify that he was one of the most truly terrifying villains in cartoons. Of course, most of the time the uncanny valley is accidental, and it's plagued digital artists for decades. One excellent example is Tin Toy, a 1988 Pixar short that features a baby that... well, doesn't look or move like any baby I know of! The 2004 movie The Polar Express also faced troubles with its human characters. It was the first film shot entirely on a motion-capture stage, so of course there were some rough edges. Mars Needs Moms faced similar troubles, and more recently Rogue One caught some flak for their CGI representation of General Tarkin. Which leads us back to Alita. The attempt seems to be to recreate the well-known Japanese style of large eyes. Robert Rodriguez confirmed this in an interview with Empire, where he said they wanted "to create a photo-realistic version of the manga eyes that we're so accustomed to seeing." He added that "When it gets to the emotional scenes it's really uncanny and striking." So far fans seem to be split: some are saying that the uncanny valley might fit the story of an android struggling to fit into a human society. Others say that she should look like the other humans, given the manga's style. A lot comes down to the writing of the movie and how it's handled, and we won't see that until July. One thing for sure though, is that everyone's going to be paying attention to those big ol' eyes.